There are several ways to perform competitive analysis on your market that will provide you with valuable insight into your competition and customers. A competitive research analysis is one of the most important processes your business. With a little work, you will get a deeper understanding of your market and gain valuable insight on market variables. There are several ways to perform competitive analysis on your market that will provide you with valuable insight into your competition and customers. There are plenty of tools out there that you can use to accomplish these tasks, but if you want to save some money then you should check out the huge list of free small business marketing tools to help your business grow! The process to research, and analyze your marketplace can be a bit tricky, but the benefits are worth it. Along with understanding your market, a robust market analysis will also give you the intelligence you need to reduce costs and prevent you from wasting time, money, and resources on a business decision that has no potential. 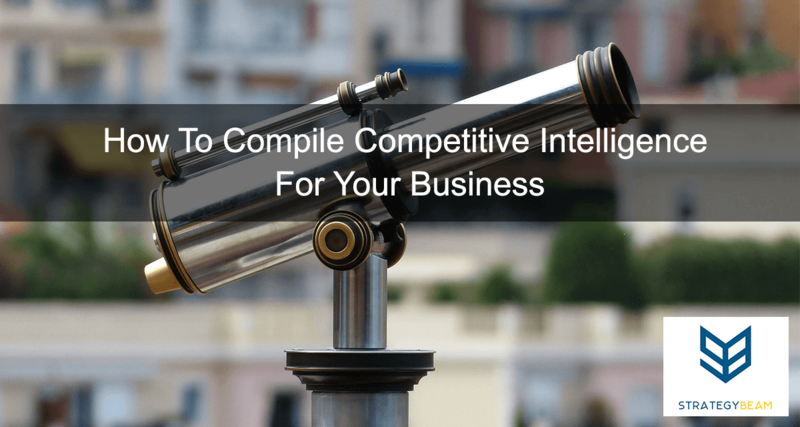 I use several free tools to perform quick competitive research analysis for my clients. A quick market analysis is not as thorough as I provide my paying clients, but these free reports provide useful insight at a reasonable price (free). Once I perform the market research, my clients love the quality and results that come from the awesome freelance copywriting services and other marketing options I provide. For the following exercise, I will use the example of a company looking to enter the organic dog food market in Orlando, FL. You can change the industry, scope, and location to match your circumstance as you go. The first thing we want to do for a market analysis is to get an understanding of who your current competition is. To do this, I will do a Google search to create a list of 5 – 6 competitors I feel would be the biggest threat to whatever industry I want to serve. 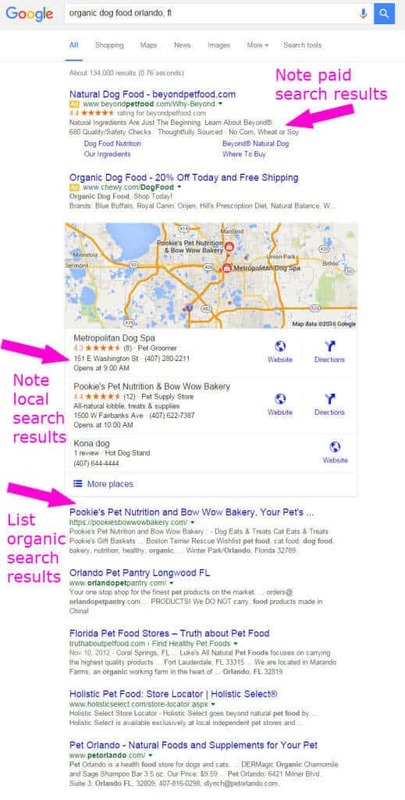 Here are the results of a simple search for “organic dog food Orlando, FL” with highlighted notes that caught my attention. As you look through the results, you want to make sure to give particular attention to some key points. What are businesses using Pay Per Click (PPC) advertising? What are companies showing up on the local mad listing? What topics are your competitors’ authorities on? The next step is to create a spreadsheet with the top 5 – 6 competitors in this market. Be sure to note any businesses which appear in paid, local, and organic results. These companies are going to be the biggest and more established brands that you will deal with in the market. SEM Rush is an excellent tool to learn more about your competition and understand missed opportunities in the market. The free version limits the results you can see, but the information you gather is enough to put together a basic competitive analysis. I am going to use Pookie’s Bow Wow Bakery for this exercise based on the Google results we gathered from the first step. 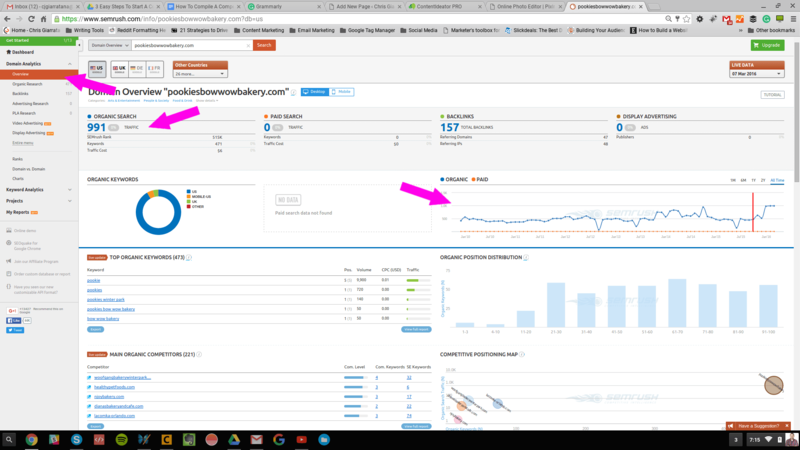 The first thing I do is look at a competitor’s website traffic by clicking on “Overview.” This helps me understand their strengths of digital marketing campaigns and their authority in the market. This report gives you an idea if this competitor is worth looking into further. I think they are healthy so I will continue researching based on their website traffic, organic search rankings, and backlinks. I am interested to see what Pookie’s Bow Wow Bakery ranks for through organic search terms. To find this information I will click on “Organic Research” tab on the left-hand side of the SEM Rush dashboard. Below are the findings from SEM Rush for their keywords. I am going to assume that Pookie’s is a dominant force in the market based on their website traffic and the high ranking of these valuable keywords. Their strong keywords show that they have a good grasp on content marketing and produce great content for their audience. Since we have a general understanding of the online traffic, strengths, and keywords of Pookie’s Bow Wow Bakery. Now I am going to look at who is providing backlinks to their site. Backlinks are an important piece of the competitive intelligence puzzle because backlinks can give a clear sign to the trust and outreach efforts of the business. While the paid version of SEM Rush is best for this type of work, the free version of SEM Rush works just fine for now. As you review backlinks, be sure also to look at the anchor text used for each link. If you see a concentration on “cat food” as the anchor text, then you know Google is ranking them high for that topic. 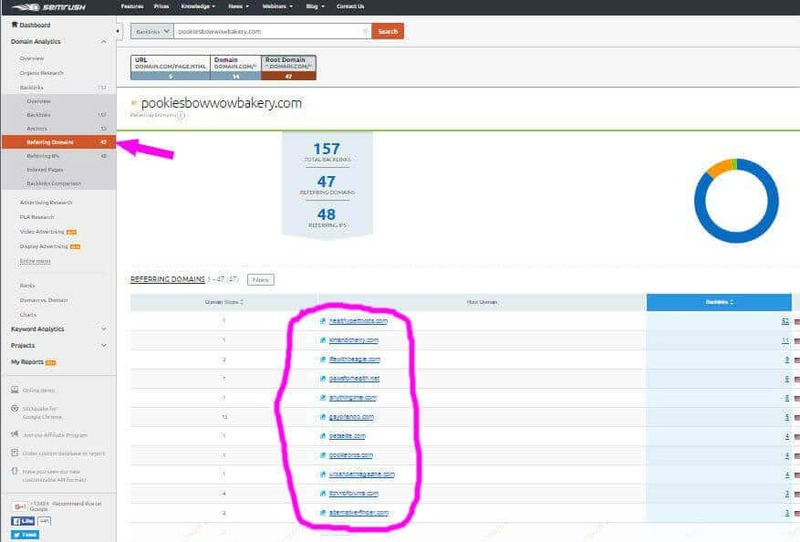 The source of the backlink is using exact-match keywords to describe Pookie’s Pow Wow Bakery. Knowing the backlinks of your competition provide you with some essential information. You can gauge the level of authority they have based on the “company” they keep. If highly reputable sources are backlinking, then you know they are leaders on that topic within their industry. If you notice your competition is receiving backlinks from common sources then you know they are Black Hat. Be prepared to attack once they are punished and see a dip in traffic. The source of backlinks should provide you with some excellent sources to reach out to and begin a relationship to grow your online reputation. There is nothing wrong with using the efforts of your competition to help guide your gains. Along with SEM Rush, SEO Review Tools helps you understand backlinks and the strengths of competition in your market. SEO Review Tools is an excellent backlink tool. Note the exact anchor text used by your competitors. Once you know the source and topic of the content your competition is ranking for, you can reach out to the sources. This will help you get the same sources as your competition and build your authority. Understanding your market is a vital part of building a sustainable business. You don’t want to jump into a market blindly without doing a little market research and gather reliable, competitive intelligence. The above study will help you understand the process of the competitive analysis. There is a lot more that goes into an active market strategy, and I would recommend you reach out to a digital marketing strategist to help you perform more market research. However, the free tools and process above are a great start if you want to do the hard work yourself. Now it’s your turn! Tell us about the tools and steps you take to perform a competitive analysis of your market!